Leeds Jewish Housing Association (LJHA) has a rich history that stretches back to when the organisation was founded on 22nd October 1953 and is an established Jewish led community based Registered Social Housing Provider committed to providing and maintaining sustainable community housing, focusing predominantly on the needs of the local Jewish community. We have almost 500 properties in our portfolio and provide a mixture of homes for single people, families, older people and shared ownership. Our properties are located around the LS17 postcode of Leeds within the areas of Moortown and Alwoodley. We developed a timeline of our properties and history, pictured below. 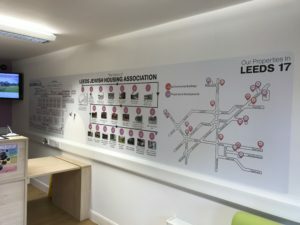 This timeline is displayed in our reception in Stonegate Way, so visitors can see the rich history of development LJHA has had over the past years. We have so much history to show off that the timeline displayed in our reception is over 14 foot long! Click the image or here to view the full version. We are registered under the Industrial and Provident Societies Act, 1965 and are a regulated by the Homes and Communities Agency (HCA). We are a member of the National Housing Federation and being recognised as a Minority Ethnic Association are members of BME National. We stick by our values every day and apply them to every aspect of or business – from the application process to maintaining tenancies – looking after our tenants and providing for applicants is our number one priority. We aim to provide the best services possible for maintaining happy tenants, allowing them to thrive in their homes; we do this by providing an increasingly speedy and effective repairs service, to putting on subsidised and free events for both our general needs tenants and sheltered tenants. 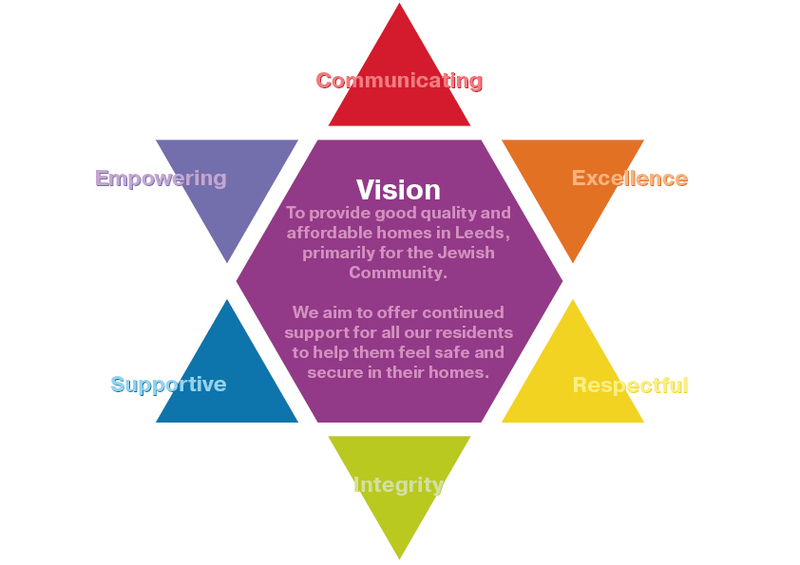 Our vision has remained the same for over 60 years – to provide and maintain sustainable community housing that is predominantly for the Jewish community, however we do not restrict our housing to the Jewish community exclusively; those most in need always come first.